Comparing the European economy to that of the US reminds me of Aesop’s fable of the race between the tortoise and the hare. The US’s flexible labour and product markets, and decisive interventions in time of crisis, give it the ease of the hare. To US politicians you only have to mention Europe to conjure up a picture of stagnant, over taxed and socialist economies. But the tortoise wins the race in the fable. And indeed, if you look beyond crude GDP growth statistics the race looks close, depending on the precise time frames and so on. GDP per head tells a different picture to aggregate GDP (this is regularly quoted by The Economist, though I haven’t found a recent example to link to). Other statistics on the incidence of poverty, life expectancy and so on, show Europe in a better light – though the US still does well in self-reported wellbeing, but not as well as Scandinavian countries. All of which demonstrates how commentators, especially in the US and here in the UK (whom I shall collectively call the Anglo Saxons, following French practice – though this is a dangerous shorthand) don’t understand the dynamics of European economic policy. As the EU lurches into another round of crises, this is worth taking on board. Once again the US hare looks better placed than the European tortoise. But look closer, and it isn’t so clear. This is not to underestimate the scale of the crisis facing the Eurozone in particular. Massive problems confront the economies of Greece, Spain, Italy and Portugal; the French economy is not in a place of safety either. But Anglo Saxon commentators tend to relentlessly focus on the short term problems, to the exclusion of longer term issues, which they assume best dealt dealt with at a later time. Europeans (from which I exclude the British, for now, though for most purposes the British are very much European) tend to look at the problem differently. A crisis is one of the few opportunities to tackle longer term problems, and fixing the crisis while neglecting the long term is criminal. The southern European economies are inefficient by developed country standards, and uncompetitive within the current Euro structure, and can’t sustain the level of social benefits that their electorates have come to expect. This lack of competitiveness was not invented by joining the Euro – it predates it, and is based on decades of poor economic leadership. Joining the Euro gave these economies a boost by reducing government borrowing costs – but this boost was used to put solving the bigger problems off until later. Their northern European partners are to blame for going along with this, until a crisis threatened to engulf them all. When the Euro project was launched, its supporters advocated it on the basis it would force governments to confront the inefficiencies of their economies, rather than rely on devaluation to put the problem off – a strategy that ultimately leads to stagflation, and even hyperinflation. But somehow these supporters seemed think that the omelette could be made without breaking eggs. But Europe’s leaders are keenly aware of their mistakes now. The position of the southern European economies is not unlike that of Britain in the 1970s. A massively inefficient and uncompetitive economy had been kept alive by a benign international economic climate, until the 1973 oil shock knocked it over. There was no quick fix, no macroeconomic palliative to ease the pain. A floating currency hindered rather than helped. The turning point came in 1976, when the Labour government had to call in the IMF. Then started a painful process of government cuts and market reforms. This wasn’t what the party had promised when elected in 1974, and the government was grudging in the reform process. They lost the election in 1979, with Margaret Thatcher being swept to power, redoubling the pace of the reform process through the 198os. This cut huge swathes through much of British industry – making the current economic crisis in the UK look like a picnic, whatever the GDP figures say. It took about a decade of pain from 1976 before clear benefits started to show. A similar hard road awaits the southern European economies. Leaving the Euro and devaluing won’t help (during the Thatcher years, to continue the comparison, the pound stayed high), and is institutionally much more difficult than most Anglo Saxon commentators assume. Europe’s politicians know this, and so aren’t looking for quick fixes. They are looking at a process of near continuous crisis in which the institutions, and political culture, required to make the Euro work are gradually put in place. Greece may be a casualty – it faces a real danger of being expelled from the Euro and probably the Union as a whole (it’s difficult to disentangle the two). It is slowly but surely being isolated to make that option less and less of a threat to the zone as a whole. But unlike many British commentators assume, Greece will find life no easier outside the Euro. This leaves “structural policies”, which is what eurozone leaders mean by a growth policy. But the view that such reforms offer a swift return to growth is nonsense. In the medium run, they will raise unemployment, accelerate deflation and increase the real burden of debt. Even in the more favourable environment of the 1980s, it took more than a decade for much benefit to be derived from Margaret Thatcher’s reforms in the UK. Structural reforms are dismissed as taking too long. But is there any other way that such necessary reforms can be taken forward? Surely the British case illustrates that miserable economic performance for an extended period is unavoidable? How different from the US approach! By comparison, the US’s economic problems are nowhere near as great as those facing southern Europe: at the core the US economy remains wonderfully competitive. But they have a terrible problem of government finance and social justice, which neither politicians nor public want to confront. Instead we get a series of short term fixes, which look decisive, but which simply increase the scale of the problem that has to be tackled later. Americans have to choose between higher taxes and reduced Medicare and Social Security benefits, or some combination of both – and yet neither are seriously on the political agenda. In the fable the hare loses the race because he is so confident he takes a nap. A similar misjudgement by America’s political class, abetted by British and American observers is in the process of unfolding. Is this the Eurosceptics’ Moscow moment? Nearly 200 years ago, in September 1812, Napoleon reached the maximum limit of his nominal power when he entered Moscow with his army drawn from right across Europe. His empire covered France, Germany, Poland, Italy, much of Spain (his lieutenants were in the process of driving back an advance by Anglo-Spanish forces that had temporarily liberated Madrid) and now much of Russia, including its Asiatic capital. But he could not hold it; by the year’s end he had been forced to abandon Russia altogether, his army destroyed, and he was completely crushed within a year and a half. For the Russians 1812 had proved a time of incessant retreat, as they avoided battle until just before Moscow (at Borodino), where they lost and were forced to abandon Moscow without a fight, but ultimately a year of triumph. Is this a fair metaphor for the British Eurosceptics in their moment of victory at the British veto at last week’s EU summit? Certainly their triumphalism is unbearable. Bill Cash was described by one of our outraged local Lib Dem members as “the cat that got the cream.” This follows one long process of retreat by British Europhiles as they conceded the political initiative to the sceptics, practically without a fight, time and again. But the initial reaction of leading Lib Dems was strangely sanguine. Nick Clegg was initially quite supportive of David Cameron. On Friday night the deputy parliamentary leader, Simon Hughes, painted a positive picture to party members at a social event which I was attending. Mr Clegg has changed his tune today, of course. Whether that is because of the sceptics’ reaction, or because further details of what actually happened at the summit have emerged (for a flavour of this read the Economist’s Bagehot blog) I cannot say. But the initial relief at the summit result shown by Mr Hughes has some logic behind it. A treaty would have required ratification by the UK parliament, and demand for a referendum. This sort of battle plays to the sceptics’ strengths – strong support by the press and a widespread wariness of extra EU power. A referendum on a treaty change is the battle the europhiles least want to fight. The sceptics can deploy a “have your cake and eat it” argument for a no vote – a vote not against the Union as such, but to protest against “Brussels”. There will be no such battles now. If there is a referendum it will be about whether we stay in the EU at all. Instead the sceptics’ position might start to come under the sort of scrutiny that it has hitherto lacked, and be shown to be no more tenable than Napoleon’s hold on Moscow. The summit has started that exposure process. The sceptics’ armchair negotiators have said that we can use the British veto to negotiate major concessions, the “repatriation of powers”; but Mr Cameron proved unable to do this. It has also been said that we were not isolated in the EU, and we could lead a gang of pro-market non-Euro members. This against has been shown to be a hollow idea, as Germany has greater influence over these potential allies than we do. Indeed a horrible spectre emerges, that the British blocking tactics make many of the EU’s institutions irrelevant while the other countries set up alternatives over which the British have no say. The sceptics often complain about Britain shackling its fortunes to a corpse – but the corpse could be the official EU structures, rather than the European project itself…and that would be an outcome entirely of our own making. And further eurosceptic fantasies will soon be exposed. Their aim is to set up some sort of free-rider relationship to the Union, where British products enjoy free access without to European markets without our businesses having to comply with those pesky social regulations. Some think the country can do this within the EU, using opt-outs, others that it can be done outside it, in the European Economic area (like Norway, Iceland and Switzerland). But this requires the other 26 countries to agree with it. All of them. Why should they? Just as the Eurozone optimists are having their ideas tested to destruction in a gruelling series of financial crises, so the eurosceptics might find themselves on the wrong side of the argument. In both cases it is clear that the only tolerable escape route involves further European integration, not less. Perhaps, like Napoleon’s collapse in 1812, it will happen quicker than we think. Posted on December 11, 2011 December 11, 2011 Author MatthewCategories Politics UK, WorldTags David Cameron, EU, euro crisis, Nick Clegg1 Comment on Is this the Eurosceptics’ Moscow moment? It’s been a tough year for Europhiles, especially those, like me, who have always supported the single currency and thought Britain should have been part of it. Most of them have been very quiet, and no wonder. Whatever one says quickly has the feel of being out of touch and in denial. And now this week the Economist asks in a leading article Is this really the end? that has been tweeted over 1,200 times and picked up over 500 comments. In today’s FT Wolfgang Munchau article is headlined: The Eurozone really has only days to avoid collapse (paywall). Is now the moment to finally let go, and admit that the whole ill-fated enterprise is doomed? There is no doubting the seriousness of the current crisis. While most of the headlines have been about sovereign debt (especially Italy’s) what is actually threatening collapse is the banking system. It seems to be imploding in a manner reminiscent of those awful days of 2007 and 2008. The Germans’ strategy of managing the crisis on the basis of “just enough, just in time” seems to be heading for its inevitable denouement. Unless some of their Noes turn to Yeses soon there could be a terrible unravelling. The most urgent issue is to allow the European Central Bank (ECB) to open the floodgates to support both banks and governments suffering a liquidity crisis. “Printing money” as this process is often referred to, seems the least bad way to buy time. Two other critical elements, both mentioned by Mr Munchau, are the development of “Eurobonds” – government borrowing subject to joint guarantee by the member states – and fiscal integration – a proper Euro level Finance Ministry with real powers to shape governments’ fiscal policy in the zone. Most commentators seem to be convinced that some sort of steps in both these directions will be necessary to save the Euro. I have a lingering scepticism about these last two. I thought that the original idea of allowing governments to default, and so allowing the bond markets to act as discipline, had merit. The problem was that the ECB and other leaders never really tried it before the crisis, allowing investors to think that all Euro government debt was secure. Still the short term crisis is plainly soluble, and most people will bet that the Germans will give the ECB enough room to avert collapse. But that leaves the zone with a big medium term problem, and two long term ones. The medium term one is what to do about the southern members whose economies are struggling: Spain, Portugal and Greece especially, with Italy lurching in that direction. The stock answer, which is to enact is reforms such that their economies become more competitive, seems to involve such a degree of dislocation that we must ask if it is sustainable. This treatment is not dissimilar to that meted out by Mrs Thatcher to Britain in the 1980s (an uncompetitive currency was part of the policy mix here, deliberately or not), for which she is still widely loathed. And she was elected (though “democratically” is a stretch given Britain’s electoral system). How will people react to unelected outsiders imposing such treatment? Better than Britons would, no doubt, since there is so little confidence in home grown politicians , but it’s still asking a lot. And that leads to one of the two long-term problems: the democratic deficit. A lot of sovereignty is about to be shifted to central institutions, and it won’t be possible to give electors much say. The second long term issue is dealing with the root cause of the crisis in the first place, which is how to deal with imbalances of trade that develop within the Euro economy. Germany simply cannot have a constant trade surplus with the rest of the zone without this kind of mess occurring at regular intervals. But there is no sense that German politicians, still less their public, have the faintest grasp of this. For them the crisis is the fault of weak and profligate governments elsewhere. So if the Euro survives the current crisis, there is every prospect of another one down the road, either political (one or more countries wanting to leave the Euro and/or the Union) or financial (say an outbreak of inflation). My hope earlier in the crisis was that it was part of a learning curve for the Euro governments. As they experienced the crisis institutions would be changed and expectations made more realistic, such that zone could get back to something like its original vision. I am afraid that there is a lot more learning to do. Does the Euro need a Big Bazooka? It is a commonplace amongst Anglo-Saxon policy makers that the Eurozone leaders need to use a “big bazooka” to solve the currency crisis that is engulfing the continent. David Cameron has been particularly conspicuous in using this expression. Is it all it is cracked up to be? So what is a bazooka? 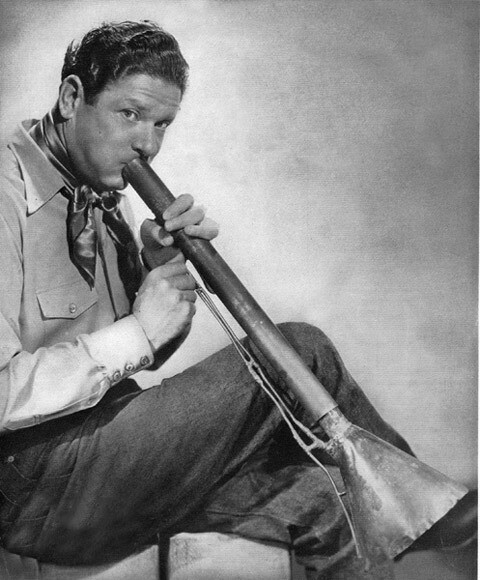 Originally it was a tubular musical instrument made famous by the comedian Bob Burns in the 1930s (Mr Burns and instrument in second picture). It then became the colloquial name for an American tubular hand-held antitank weapon introduced in the Second World War (the illustration above is in fact of a more modern and shorter weapon). This was a revolutionary innovation, using recoilless technology and the so-called HEAT armour-penetration system – which allowed infantry to threaten tanks in a way not previously possible. The Germans quickly copied it with the bigger and better panzerschrek (“tank terror”). They also developed countermeasures, including thin armoured outer skirts to their tanks, which set off the HEAT system before it could inflict serious damage. 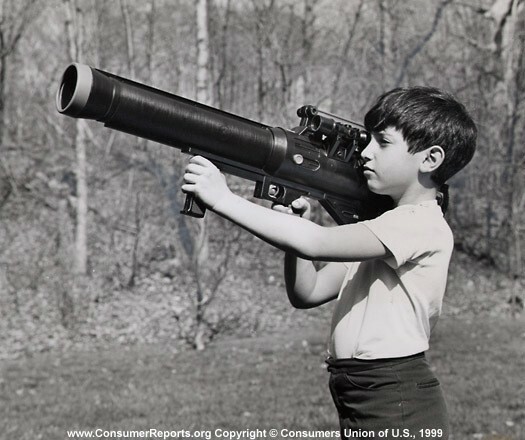 In the 1960s the weapon became obsolete, replaced by more powerful technologies. A “big bazooka” in the current context is used to mean the deployment by the state (central banks and/or governments) of overwhelming financial resources to bail out troubled banks and others in a financial crisis. The idea is to break a vicious cycle of declining confidence in banks and others, whereby lack of confidence becomes a self-fulfilling prophecy as creditors seek to move their money into safer places. The mere proposition of such resources can be enough to break the cycle, if credible, and prevent the resources ever having to be deployed. The Americans can proudly point out to the use of the technique to solve a series of financial crises, from the Savings & Loan crisis of the 1980s, to the LTCM collapse of the 1990s and the Lehman crisis of 2008. Such tactics are conspicuous by their absence in the Euro crisis, fiercely resisted by the German political class in striking unanimity. There is an irony that the original bazooka was quite a small weapon – but I suppose it was big for one held by a single infantryman, and the German version conveys all the imagery the metaphor needs. A more telling parallel is that the bazooka, revolutionary when introduced, steadily became obsolete as the world got used to it. No doubt the Germans will point out that the American use of “big bazooka” tactics on repeated occasions shows that there is a flaw. The American financial system suffers a systemic crisis every 10 years or so. This is the first such crisis the Germans have endured since their currency was refounded after the war – and that is because the Germans aren’t running the show. The have a point. The financial markets are amazingly short-sighted – for example that idea that the US and UK are safe havens because their central banks can overcome any crisis by “printing money”, or monetising debt, in the manner of Zimbabwe. But the long term logic always wins in the end. There seems to be a slowly dawning realisation amongst Anglo-Saxon commentators (for example last week’s Martin Wolf column, as well as the Economist) that the German position in all this amounts to a strategy, “just enough, just in time”, and not the absence of one – even if Mr Wolf grumpily calls it “too little, too late”. The short-term costs of the German strategy are doubtless higher than the American way – but the longer term position is much less clear. I do not regret paying my access fee to the FT website. This morning there are two excellent articles on the Euro crisis from the two regular Wednesday morning columnists: Martin Wolf and John Kay. It has helped clarify the way ahead for me. Mr Kay comes in at high level to give an overview of the crisis. It is not comfortable reading for supporters of the Euro project like me, but, as usual for this author, pretty much spot on. The main problem is not that the currency area lacks appropriate institutions at the centre, but that local institutions in many member countries are not strong enough to cope with the pressures of being in the single currency. The eurozone’s difficulties result not from the absence of strong central institutions but the absence of strong local institutions. A miscellany of domestic problems – rampant property speculation in Ireland and Spain, hopeless governance in Italy, lack of economic development in Portugal, Greece’s bloated public sector – have become problems for the EU as a whole. The solutions to these problems in every case can only be found locally. So the answer will not come from strengthening the EU’s central institutions. This goes back to the original design of the Euro: the whole idea was to put pressure on governments to reform themselves, by denying them the easy escape route of devaluation. Unfortunately the EU’s politicians forgot this in the first decade of the Euro, so no real pressure was brought to bear, making the crisis infinitely worse once it hit. This article does not say much about how to go forward from here, beyond suggesting that grandstanding at summits like today’s may be part of the problem rather than the solution. Mr Wolf’s looks at one aspect of how to manage the crisis itself. This in turn in is based on a paper by Paul de Grauwe of Leuven university, who literally wrote the textbook on the Euro (I know, since I read it as part of my degree course). Professor de Grauwe points out an interesting fact: the bond markets are much harder on the Euro zone fringe economies of Italy and Spain than they are on the UK, even though the underlying positions of the countries is not all that different. The difference is that the UK markets are stabilised by having the Bank of England as a lender of last resort which is able to deal with liquidity crises (i.e. an inability to raise cash for temporary reasons rather than underlying insolvency). The European Central Bank does not do this, or not enough, for the Eurozone economies. Mr Wolf, who structures his article as an open letter to the new ECB president Mario Draghi, argues passionately that it should. This would stop the contagion spreading from the insolvent economies of Greece and maybe Ireland to solvent but challenged economies like Italy, Spain and indeed France. This must be right. The Germans, who are the main sceptics, must be persuaded – and convinced that such interventions would only apply to liquidity crises and not solvency problems, and that the ECB has the integrity and independence to tell the difference, in the way that politicians never do. Giving the ECB a wider and stronger remit will be a big help. This should extend to supervision of the European financial system (preferably for the whole EU and not just the Eurozone). This will help deal with one of the biggest problems for modern central banking – that of coping with spillover effects, as described in this thought-provoking paper from Claudio Bono of the BIS (warning: contains mild economic jargon, such as “partial-equilibrium”). So a reconfigured ECB will help the Euro through the crisis and prevent self-fulfilling prophesies of doom in financial markets having to be solved in grandstand summits. That still leaves the longer term problem of how the less competitive Southern European economies can have a long term future in the zone. But then again, I think they would have just as challenging a future outside the zone – even if it were possible to devise an orderly exit mechanism for them. It is a commonplace for Britain’s politicos to sadly shake their heads and complain that the Euro crisis demonstrates a woeful lack of political leadership. Regardless of the fairness of this charge in respect of Angela Merkel, say, it clearly has resonance for Britain’s own leaders. There seem to be two camps: ravingly impractical Eurosceptics, and sheer paralysis from everybody else. The mood amongst Europhiles (as I witnessed at fringe meeting at the Lib Dem conference) is akin to deep depression. It is time for this to change. To be fair some key players have been showing something less than paralysis – George Osborne and Nick Clegg have both been conspicuous in raising the seriousness of the situation with their international colleagues – but their pronouncements are hardly more helpful than anybody else’s. They aren’t bringing anything to the party and they aren’t trying bring our own public alongside. The first point is that the Euro crisis has serious implications for Britain, much though most people seem to think it is happening to somebody else. This is for two main reasons. First is that this country would be caught up in any financial disaster. Our oversized banks are deep in the mess; Euro zone countries are vital trading partners for a country very dependent on trade – especially given that international financial services are so important to us. Our fragile attempts at recovery risk being completely blown off course. Forget Plan B if this lot breaks. The second reason it matters to Britain is that resolution of the crisis could take the European Union in a direction that is against our interests. Britain leads the single market wing of the union: the chief Euro zone countries are more protectionist in their instincts. We risk being shut out of the design of critical architecture – much as the Common Agriculture Policy was put together in our absence. How to proceed? We need to tackle the dark spectre head on: the best resolution of the crisis involves changes to the European treaties. To change the treaties will require a referendum here (let’s not weasel out of it this time). If we face up to that challenge now, it will show real courage, and help get things moving. But, of course, we would need to see something in return. Changes to the treaties that would further our interests. These need to be to promote the single market, to protect London (and Edinburgh) as centres for financial infrastructure, and to reduce unsightly bureaucracy and/or operating costs of the Union (the siting of the European Parliamnet at Strasbourg needs to go on the table, at least). Given our understanding of finance, we might well have useful things to say on the Eurozone architecture too – even though we clearly can’t be part of it. To do this our leaders (the Prime Minister and the Deputy Prime Minister in the lead) need to build two sets of alliances. The first is within the British body politic, so that the referendum can be won. This needs to cover Tory pragmatists (David Cameron, George Osborne and William Hague), the Labour leadership and, preferably, the SNP. The Lib Dems have an important role in making this hold together since, by and large, they understand the Union the best. Mr Clegg’s experience of deal-making in the European parliament counts for a lot. The next set of alliances is within the Union itself, to create a Single Market bloc. The obvious candidates are the Nordic countries, Ireland and the Netherlands, together with many of the newer members in central and eastern Europe. This will be very difficult. That’s the point, almost. The reward is a stabler EU, constructed more to our taste, even if we must concede some powers to an inner core of Euro area countries. Everybody wins. And by taking on the wilder Eurosceptic fringe, including their newspaper backers, it will cheer all right-thinking people up. It’s time we stopped being paralysed by fear and came out fighting.